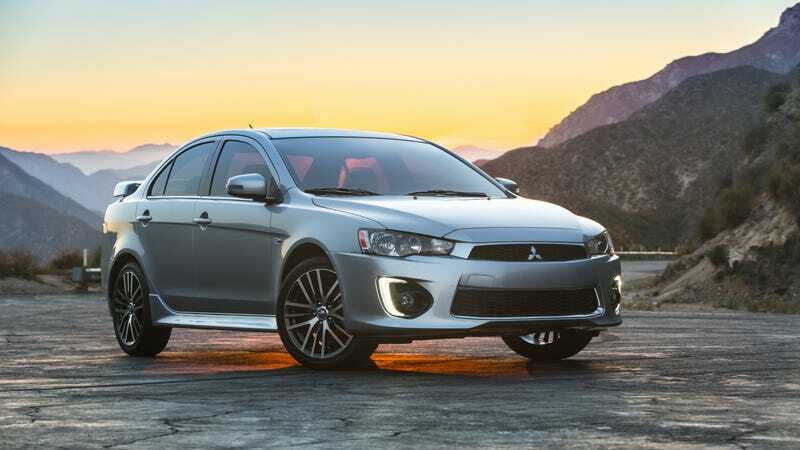 The 2016 Mitsubishi Lancer GT. January sales charts at Mitsubishi North America came to us last week with bad news: A total of negative three (-3) people bought a Mitsubishi Lancer, our old, discontinued friend, last month. That, as sad as it is, puts year-to-date sales on the world’s rally car for the road at negative three. Give a Lancer a hug, if you see one. The Lancer needs it. Our dearly departed Lancer, which we never thought would truly leave us, was cut from the Mitsubishi lineup in 2017—the same year the company debuted the Eclipse Cross, a crossover that took the Eclipse nameplate and did unspeakable things to it. But sales tallies often include discontinued cars, so automakers can list when they’ve sold old model years that are still technically “new” on the lot. But that tally works the other way as well, like when companies have to subtract vehicles from the numbers. In December, for example, Hyundai Motor America recorded that it sold negative one Azera sedans. With Hyundai, the negative one Azera was to correct a previous month’s report listing the sale of an Azera that was later returned. We’ve asked Mitsubishi the specifics on the Lancers, and will update this story if we hear back. The rest of the January sales at Mitsubishi North America, which wants to be cool again but first has to remind people that it still makes cars, weren’t terrible in context. The company said January was its best sales month since 2007, and that it was an increase of 2.7 percent over last year. But the figures were still small, with Mitsubishi North America reporting 8,708 vehicle sales last month in comparison to larger brands like Kia Motors America or Subaru of America, which reported sales of more than 37,000 and 46,000, respectively. Mitsubishi’s numbers would have been marginally higher, though, if it weren’t for those poor negative three Lancers. Even if the gesture doesn’t mean much now, pour one out for the Lancer—a car that, no matter how long it could fight death, can’t really fight being taken back to a dealership. Update: Tuesday, Feb. 5, 2019 at 2:12 p.m. ET: A spokesperson from Mitsubishi responded to Jalopnik’s request for comment, giving the below reasoning for the sales record via Jeremy Barnes, Mitsubishi North America’s senior director of communications and events.